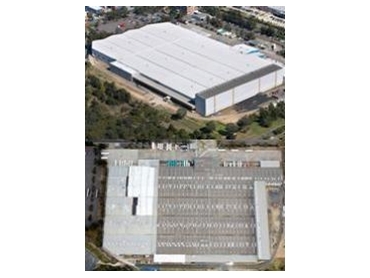 Lidoran Roofing have completed their most complex job – a 41,000m2 metal re-roofing and asbestos removal. When a client looked for a reputable roofing company which are also skilled in asbestos removal, Lidoran Roofing were selected to carry out the metal roof replacement works by the client. Before receiving the order, the logistics of this programme were discussed. Stage 1, the metal re-roofing portion of 12,000m2 could only be done on Sundays. First, up went the stair access, towers, edge protection and amenities. Six days later 28 roofers arrived with eight truckloads of gear and one large 100 tonne crane. Stage 1 was the removal of the old 0.42 Zincalume Trimdek and the installation of 0.48 Kingklip 700 with new 2mm wire mesh and 75mm insulation, which took only 7 Sundays to complete. Stage 2 consisted of 28,000m2 of asbestos removal, which could be carried out through out the week. However, as the building was occupied, there was the need to create a barrier beneath the asbestos removal and roof replacement and that of staff in the building. The solution was to build a scaffold over the internal racking approx 1.5m under the roof and then sealed with plastic. There were many challenges faced on site from heat waves in Summer through to ice on the roof in Winter. Another part of the job was also the installation of ventilation and fire control systems for the 41,000m2 ware house.